IT could’ve been a scene from the ‘X-Files’ or any horror movie. But the unimaginable happened in Kuantan, Pahang when the tied-up, mutilated body of an 11-year-old girl was discovered by villagers in an oil palm plantation. Villagers at Kampung Tanjung Medang Hilir, Pekan, gasped in horror over the weekend when the remains of Siti Masyitah Ibrahim, who had been missing since Jan 30, were seen in a shocking condition. Rather unbelievably, she had been decapitated and some of her internal organs removed. Police say her hands and legs were tied and her head separated from her body. Even in such a condition, her mother, Zaleha Abdullah, was able to positively identify her daughter. Police say the girl’s parents – Ibrahim Ali, 39 and Zaleha Abdullah, 35 – were immediately informed of the discovery, and they rushed to the scene. The grieving mother revealed that although the body was badly mangled, she was able to make a positive identification based on the blue dress which Siti Masyitah was wearing the day she disappeared. At 5.00 pm on Jan 30, she says her daughter asked her for RM1 (S$ 0.33 cents) so that she could purchase something at a shop, and promised to return home as soon as possible. “She said she would return home early. That was the last time I saw her. I lodged a police report at the Pekan police station on the same day,” she adds. “With the help of villagers, we also mounted a search around the village every day for the past 11 days. Siti Masyitah, the third of four siblings, was described as a jovial girl. 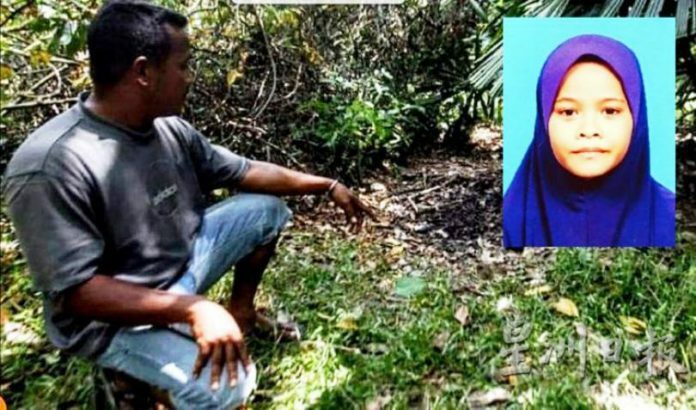 Detectives believe Siti Masyitah may have been killed elsewhere and probably dumped in the remote-side of the oil palm plantation. Pekan police chief Superintendent Amran Sidek confirmed the discovery of the body when contacted. Supt Sidek says the National Urgent Response (Nur) alert system, which publicises any disappearance of children, was not activated in this case because Siti Masyitah’s parents were foreigners who had settled down in Pekan and did not possess identification documents. “The missing victim and her parents do not have identification documents so we could not identify their backgrounds. We only know that they have been living in Pekan for a very long time and the family has settled down here,” he says. He added Siti Masyitah’s mother, believed to be Cambodian, has no identification documents or permanent residency card. She had lodged a police report on Jan 30 about her missing daughter, who also does not possess any identification documents. For the record, ‘Nur Alert’ is a system to spread information quickly to help trace missing children below 12 years of age who could be victims of crime or abuse. Detective sources say prior to her disappearance on Jan 30, Siti Masyitah was spotted riding pillion on a motorcycle with a man in Kampung Tanjung Medang Hilir. The man, a foreigner, and believed to be a family friend, is currently serving a 14-day remand order. He is believed to be the last person spotted with the missing girl. “The victim was last seen riding a motorcycle with the man on Jan 30. We have detained him for questioning and he is remanded under Section 6(1)(c) of the Immigration Act 1959/63 for failing to provide any valid travel documents,” said a police spokesman. For the moment, as the horror of horrors sets in, the villagers keep wondering if she could be a victim of an organ trade syndicate. Only a formal post-mortem at the Tengku Ampuan Afzan Hospital (HTAA) will determine the child’s cause of death. 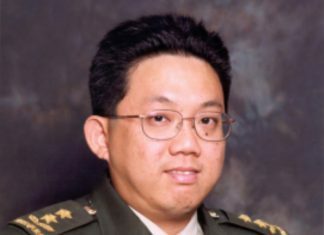 The forensics report will allow detectives to probe further the various angles to determine if the missing organs had been eaten by wild animals or harvested by an organ trade syndicate, or if the victim was raped, and how many days earlier she had been murdered.